The first two Farmer’s Markets took place on June 4 and June 11 with a great turnout in the downtown park from 5-7 p.m. Continue to make a point to stop at the Farmers Market each Tuesday this summer and enjoy our great local vendors. Next week you can expect to see Mary Ellen Pankratz selling baked goods, Cathy Wismer selling fresh bread, jams, jellies, produce, herbs quick bread and soup mixes, Marcee Van den Berg selling fruit pies and produce, produce from Luke’s Garden, Tanya Davis selling Mary Kay, Christina Dose selling Pampered Chef, produce from Grace Children’s Home, Home Made Patchworks by Elvina Janzen and local honey from Bear Creek Honey. A meal will also be provided by the Heartland Community School Graduating Class of 2016. 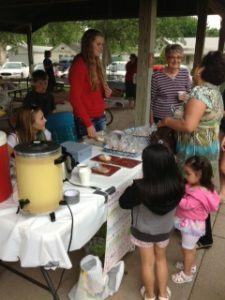 If you are interested in selling homemade and homegrown products during a Farmers Market this summer contact the Henderson Chamber of Commerce, at 723-4228 or hchamber@mainstaycomm.net, at least one week before the next Farmers Market.